On this midnight cycling trip in Mumbai, you’ll pedal along the coastline to visit some of the most prominent destinations and landmarks of the city. Ride down the Marine Drive, Worli seaface and Bandra Bandstand and admire the brightly lit skyline of coastal Mumbai. You’ll also explore the heritage and culture of decades past at the iconic Gateway of India, the grand Flora Fountain and several monuments of architectural wonder. 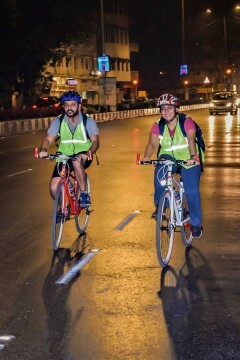 If you’re new to Mumbai or just want to plan a fun activity on the weekend, this midnight cycling trip in Mumbai is perfect for you. Spend a night exploring the coastal seafront of Mumbai and renew your amazement for the city that never sleeps, yet harbours a million dreams. With the bright yellow street lights shining down under a dark sky, you’ll ride your bicycles and explore the charm and mystique of Mumbai’s most renowned landmarks. You’ll hop on to your cycles and pedal to some of the most celebrated landmarks of the city define the history and culture of Mumbai. Some of the landmarks covered in this cycling trip include Taj Mahal Palace, Gateway of India, Marine Drive, Taraporewala Aquarium, Girgaon Chowpatty, Breach Candy, Haji Ali, Worli Seaface, and Bandra Bandstand. • Embark on a late night cycling trip in Mumbai. 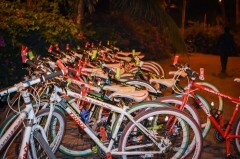 • Ride for 25 kms and explore Mumbai's coastal skyline at night. • Visit popular landmarks and destinations along Mumbai's seafront. Cyclists below the age of 18 are required to be accompanied by an adult. Cyclists are required to adhere to the instructions of the tour leader during cycling in Mumbai. For cancellations made 7 days or more before departure of the Mumbai cycling tour: 85% refund. For cancellations made less than 7 days before departure of the Mumbai cycling tour: No refund. Cyclists are eligible for a discount of INR 450 if they bring their own cycles on the trip. In this case, cyclists are also required to bring their own helmets. If unable to complete the tour, cyclists who have rented cycles from the tour operator will need to transport the cycles to the end point at their own expense. The tour operator takes utmost care to ensure safety of the travellers and shall not be held responsible for any mishap or accident during cycling in Mumbai. Midnight costal cycling in Mumbai! Arrive near the Kailash Parbat restaurant in Colaba Causeway by 23:00 hrs. Here, you'll meet the rest of your cycling group and receive cycles. After a brief orientation session and a short test ride, you'll begin the cycling trip that will take you along the coast of Mumbai to prominent destinations and famous landmarks. Your route is as follows: Leopold Cafe, Taj Mahal Palace, Regal Cinema, Gateway of India, Rajabai Clock Tower, Bombay High Court, CST railway station, BMC headquarters, Marine Drive, Taraporewala Aquarium, Girgaon Chowpatty, Breach Candy, Haji Ali, Worli Seaface, Siddhivinayak Temple, Shivaji Park, Mahim Dargah and Bandra Bandstand. Your trip ends here. Cycling on the empty roads of Mumbai. Your cycling trip begins at 23:00 hrs at Colaba Causeway and ends at 04:30 hrs at Bandra Bandstand. No meals are provided throughout the trip. Colaba is well-connected to most major parts of Mumbai via road. You may board a local train in Mumbai to reach the CST railway station and take local public transport to reach Colaba Causeway.